If I had to describe our trip to Victoria Falls Zimbabwe in one word that word would be wet. Mr. Deep and I spent most of the trip in a soggy state. It's a good thing that we had a four poster bed in our hotel room because the posters came in handy as we were constantly hanging up our clothes in an effort to dry them. We got so wet during the weekend that two pieces of electronic equipment became too wet to function. More on that later. The day we arrived we walked to the falls from the hotel. This time of year the falls are very full and the spray was intense. We were soaked by the time we returned to our hotel. The bridge between Zimbabwe and Zambia and water on our camera lens. The next day, we went whitewater rafting on the Zambezi. Rafting is something that we both enjoy and we returned to the falls in large part to go rafting. Our guide's name was Gordon and in addition to Mr. Deep and me there were four male German tourists in our raft. The safety briefing included information about how to paddle as well as an overview of various commands that our guide would give us as we headed down river. The briefing also included information about what do if we fell out of the raft or if the raft flipped over. It is during safety briefings that one begins to wonder if rafting is a good idea. Fortunately our raft did not tip but we did see another raft flip. 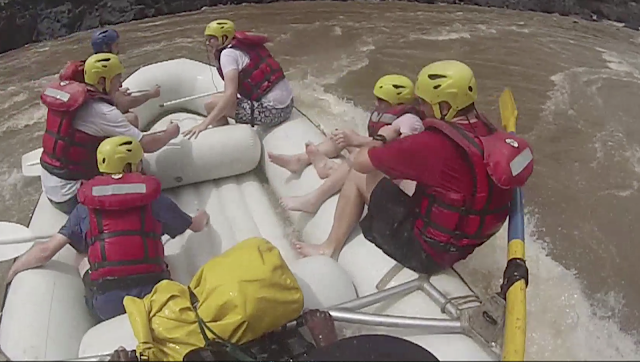 As rafting is a wet endeavor it is recommended that guests not bring phones or cameras on the trip. One person in our party, whose name rhymes with Kister Bleep did bring his phone because he thought it would be safe wrapped in a zip lock bag. The phone got wet and did not work for the rest of the trip (or ever.) 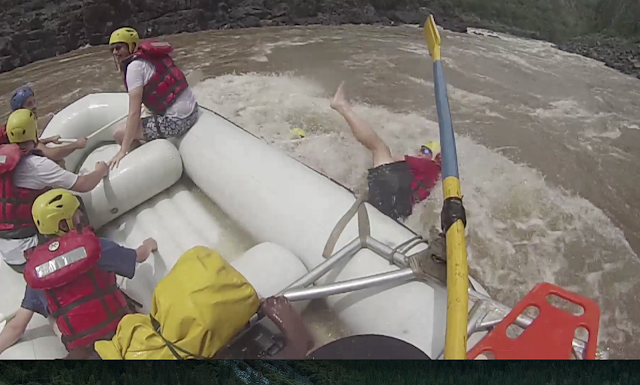 Luckily, the rafting company provided a camera man who videotaped the event and took still photos. Gordon was also wearing a Go-Pro. For $55 Mr. Deep and I walked away with a thumb drive that included photos and a video of our rafting adventure. The next seven photos are courtesy of Shearwater, the company that we used for the rafting and all of our activities throughout the weekend. Our crew. That's me in the back middle. Maybe our raft didn't flip but we were submerged! Mr. Deep is the rare mix between a rule follower who loves to be prepared for any situation and a rebellious teenager. The rebellious teen behaviour is evidenced by some of the still photos that we reviewed days later when we returned to Joburg. You can see that Mr. Deep did not follow instructions when told by Gordon to "get down." Instead, he thought it a good idea to stand up and smile for the camera. In one hundred years it would never occur to me NOT to follow the guide's instructions. Largely because I prefer not to die. I asked Mr. Deep if he did not think it was important to follow the safety commands and he said he did, but that he thought it was more important to get some really funny photos. At one point, the raft tipped in such a way that both Mr. Deep and I fell out (the German's remained intact.) I think this was likely the nail in the coffin for the phone as well. Thankfully it was easy to grab on to rope on the side of the boat and we were pulled out quickly. The German guy who pulled me out said he couldn't wait to go home and tell everyone that he "rescued a woman who fell into the Zambezi." The next day was Sunday and it was Mr. Deep's turn to try again (and for the last time) to catch a tiger fish. I was still sleeping when the phone rang early in the morning. It was the fishing guide calling to say that it was raining and did Mr. Deep still want to go out? I assured him that he did and was already in the lobby waiting to go. Mr. Deep said it was pouring with thunder and lightning when he and his guide left the hotel. Because of the weather at first they could only fish from shore. Eventually the lightning stopped and they were able to go out in the boat. Regardless of being completely drenched Mr. Deep had great success! The guide was so excited about Mr. Deep's catch that on the way back to town they stopped to show the fish to the guide's brother and also to his boss. Mr. Deep gave the fish to the guide. Sunday afternoon the weather cleared up but Mr. Deep and I still found a way to get soaking wet while simultaneously pondering the fact that we might be insane. We swam (or more accurately sat) in Angel's Pool which is situated on the edge of Victoria Falls. 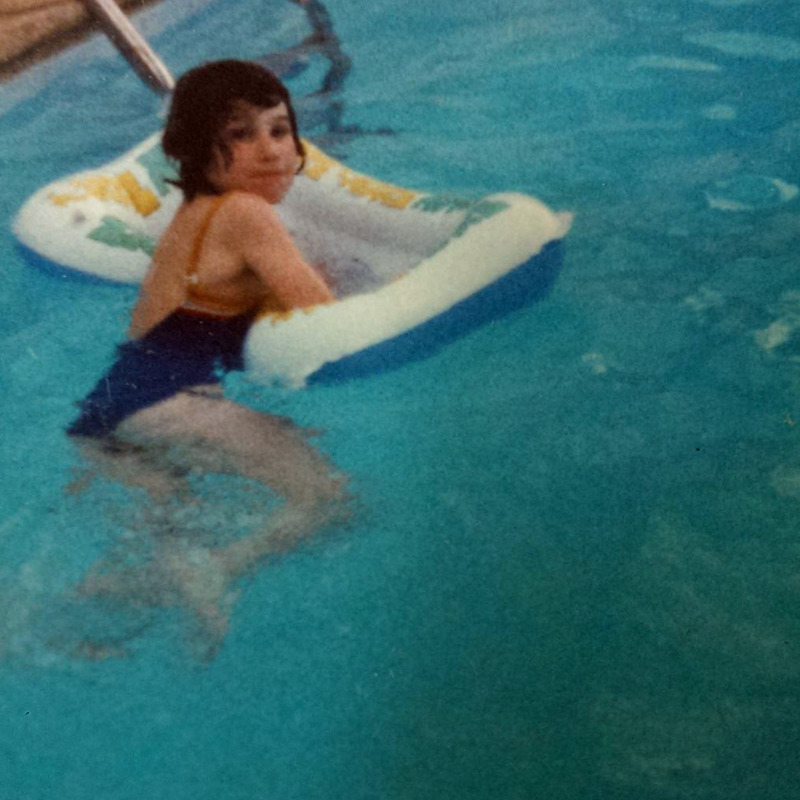 And by pool I don't mean a relaxing swimming pool near the falls. I mean a pool of water that forms right before it cascades with massive force over the giant cliff that is Vic Falls. The rain made the water in the falls even stronger and higher than it had been the day before. If you're familiar with the falls you might wonder why we didn't swim in Devil's Pool which is the pool where this activity of risking your life normally takes place. It's because the water was too high and Devil's Pool was closed. For this adventure we had to cross the border from Zim into Zam. We had one driver take us to the border. Then, another driver met us, got our passports stamped and drove us across the bridge (same bridge as in the photo above) to Zam. We were then taken to the Royal Livingstone Hotel where we meet a third guide who took us and several others by a short (five minute) boat ride to Livingstone Island. Livingstone Island is a small island in the middle of the Zambezi just upstream from the falls. It is from this island that Dr. David Livingstone first viewed the falls and named them for Queen Victoria. While Angel's Pool sounds lovely and tranquil as compared to Devil's Pool, it was still quite a shock and a thrill to sit so close to the falls. By the way, of our group of eight, only three of us sat in Angel's Pool. The rest declined. The photos below were taken by our guide. He used our camera because at this point we were down to one working phone. As he was taking photos the guide told us our camera battery had died. But, when we returned to the hotel and put in a new battery the camera still would not work. Once back in Joburg I had to take the camera in for a dry out at the camera shop. Luckily the guide was able to take the photos below before the camera became too wet from all of the spray as there is NO POINT in sitting in Angel's Pool if it's not being captured on film! I'm pretty sure here that I was whispering "what the F%&@ are we doing?" in Mr. Deep's ear.